By Sheela Speers of the Ulster Museum. THE LAYOUT, format and content of Under The Big Lamp – Historic photographs of the county and town of Carrickfergus is simple but effective. The first few pages give a historical overview of Carrick from Medieval times. This is followed by page after page of black and white photos (complete with explanatory captions) taken between 1870 and the late 1930s. What makes it different is that it resists the natural temptation to focus exclusively on the castle and harbour. “The history of the town and people of Carrickfergus (though influenced by the presence of the castle) is a quite distinct story, encompassing eight hundred years of urban development and change”. Thus it remains a “town-centred view of Carrickfergus and the surrounding district; the castle is seen more distantly, as a backdrop to the life of the locality and its people”. Carrick grew up around the castle, which was built by John de Courcy to defend the Anglo-Norman principality, which he established in east Ulster in the last quarter of the twelfth century. Two other buildings also dominated Carrick: the parish church of St Nicholas and the friary of St Francis. These three buildings formed a triangle – within this triangle were the streets, dwellings and market place of Medieval Carrickfergus. Between the Thirteenth and Sixteenth centuries, the layout of the town remained virtually the same. Wealthier families built stone tower-houses, but the majority of dwellings were single story thatched houses. 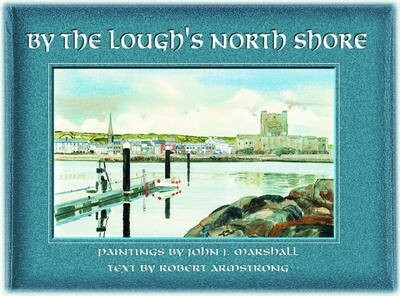 During this medieval period, Carrick was Ulster’s main port and it enjoyed trading contacts with Europe. The town was granted borough status in the Thirteenth Century. “This gave the town independence from the lords of the castle and made it a self-governing community with a mayor and corporation”. During the Sixteenth century, Carrick was the headquarters of Queen Elizabeth’s royal armies. The Seventeenth century saw the town’s reconstruction – it had virtually been destroyed by fire in 1573. The Eighteenth century saw the building of the Co. Antrim courthouse, gaol and custom’s house. The county of Carrick was largely rural (apparently cheese making was a speciality!) although increasing numbers were employed in linen bleaching and hand loom weaving, and in cotton print works. The Nineteenth century saw dramatic change – Carrick ceased to be both a garrison town and county town of Antrim. Against this saw the growth of linen industry, the establishment of salt mining and the opening of the shipyard. After this brief historical overview comes the main section of the book – around 100 black and white pictures divided into different chapters, each with a different theme: Castle and Harbour, Churches, Town and People and so on. The book has so many interesting photo’s it’s virtually impossible to describe them all. I was really interested to read about the salt mines at Duncrue, Maidenmount, Frenchpark and Eden. I’d heard of them, but didn’t know too much about them. Therefore the pictures of the mines are very interesting – salt mining looks to be a physically demanding and an arduous job. Under The Big Lamp left me gobsmaked when I read about the Carrickfergus Shipyard. Sadly, there’s not too much information about the yard, although the first ship launched from the yard was the David Legg in 1845. Whilst the Carrick yard was nowhere the size of Belfast’s Harland & Wolff, a picture shows the workforce to be about 100 strong. It appears that Legg Park is now situated on the old yard site. Indeed, a picture of the park taken in 1930s shows an outdoor swimming pool in the park – believed to be constructed from the yards former dry dock. Another connection with the Carrickfergus Shipyard is a wonderful picture of the Result. This steel, three-masted topsail schooner was designed and built at the yard in 1892. Sadly it’s now reduced to just a rusting hulk at the Ulster Folk and Transport Museum, in Cultra. Other fantastic photographs include one of children playing on the main road in Eden, with just a horse and cart for company; Barn Spinning Mill at Taylor’s Avenue and Robinson’s Butcher’s Shop in Market Place. This last photo is remarkable in that most of the produce is hanging outside the shop on open display. God knows how many European Health and Safety laws this would contravene today!